This 9th Annual Golf Day was held at Pupuke Golf Club on the North Shore. The Labour Exchange team finished an honourable 6th out of 34 teams with the boss, Dave Devereux, winning the 'Closest to the Pin' on the 17th - the only decent shot he hit all day! The Labour Exchange also sponsored the 7th hole where Bacon Butties and Bloody Marys were the order of the day. All the team was out in force and a great day was had by all. This annual event is always a great day out and this February's event was no exception. The Labour Exchange, as usual, entered a team of 10 made up of staff and customers. 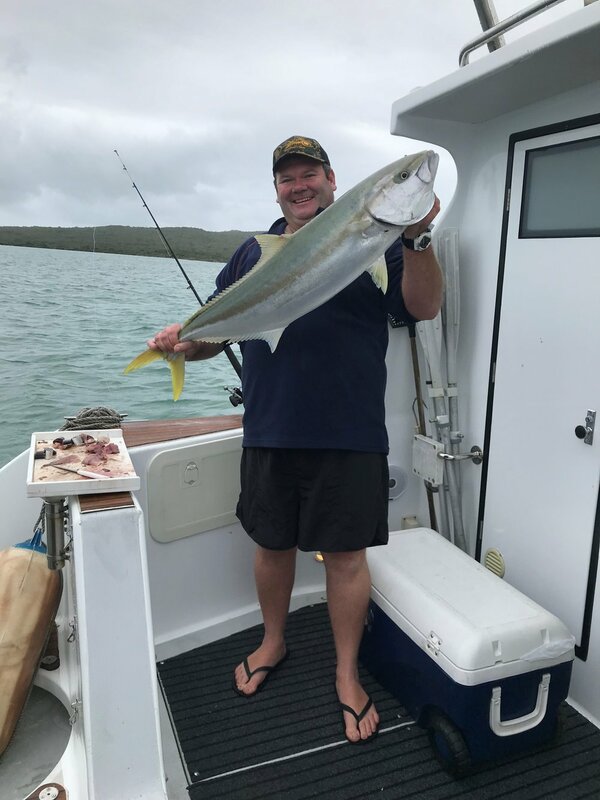 In fact, one team member, Shanon Imms from CMP, caught a great kingifsh which was the biggest fish of the day in its class - see opposite. The HR team at The Labour Exchange has already noticed the difference Better Me has made. “It’s amazing to see the impact it’s had on the boys. Watching them grow and develop over the course of Better Me was awesome.” Moreover the HR team noted better engagement and communication, increased confidence, better understanding about completing time sheets, improved participation in Toolbox meetings, and more willingness from workers to work more hours. The Labour Exchange’s Craig Sturmfels and Steve Malcolm were recently awarded their Certificates in Construction Site Safety at the annual Site Safe Construction Health and Safety Awards ‘Evening of Celebration’ at Alexandra Park. The awards acknowledge people, sites or companies/organisations who have demonstrated innovation and leadership in helping to improve health and safety in the Construction Industry. Developed in collaboration with Unitec, the Certificate is recognised throughout the industry and is a great way for workers and management to advance their skills, knowledge and career. Candidates must complete a range of Site Safe courses, and each time gain Site Safe Certificate credits. When they have collected 40 credit they are awarded the certificate level NZQA qualification - the HIGHEST Site Safe qualification. Well done Steve and Craig. 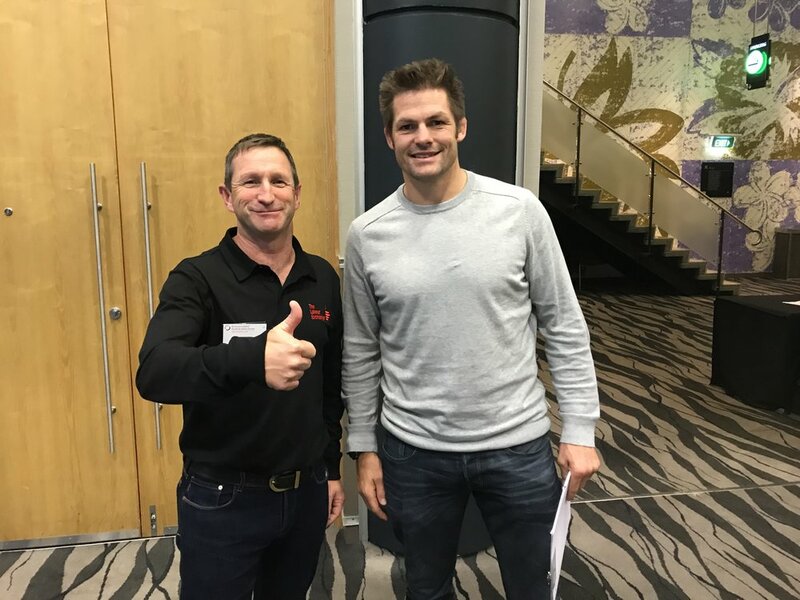 Dave and Richie McCaw, in his role as a business owner, both attended the 2017 Mid-Year Summit, held at the SkyCity Convention Centre, where the central topic was 'Engaging the Workforcs as Experts in your Business'. The keynote speaker was Dr Todd Conklin, the renowned US Human Performance Expert. At the recent Civil Contractors NZ Golf Day the Labour Exchange won the prize for the 'Best Dressed Team'. The theme was 'Lions Tour'. Unfortunately their golf was nowhere near to winning any prizes but a good day out was had by all. The Labour Exchange recently held a Safety BBQ for 150 people at 5a Madden Street, a Hawkins site. It was a good opportunity for the main contractor and other subbies to get together and discuss safety matters over a hot sausage from the BBQ. Many thanks go out to Jerry, Fiona and Julio from Hawkins for allowing us to do this.